When we cleared out Mother’s house last year, we set aside some of her treasures to be passed down to the next generation. This month we are labeling these items with specific names to avoid mix-ups. 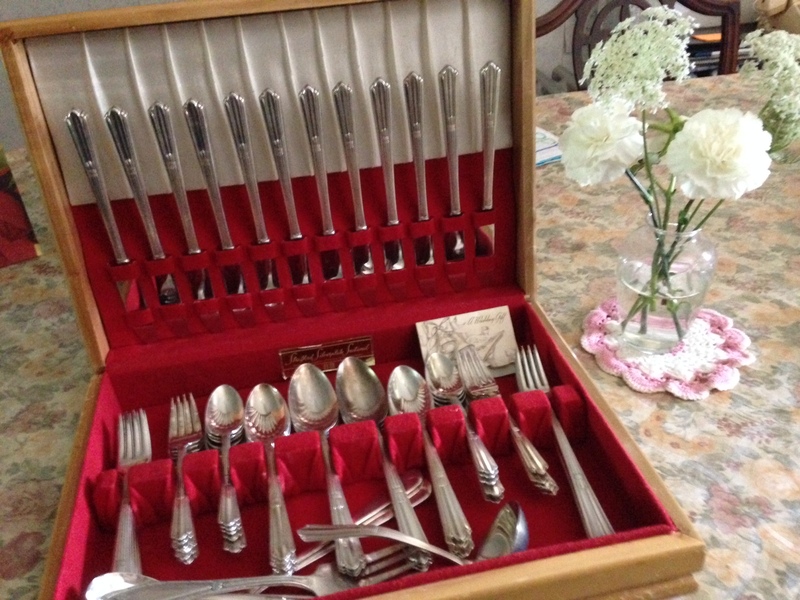 One of Mom’s prized and most used wedding presents was her set of silverware. You can see the complete set here with a card that reads simply in blue cursive: “From Ray,” the groom, and then her new husband. 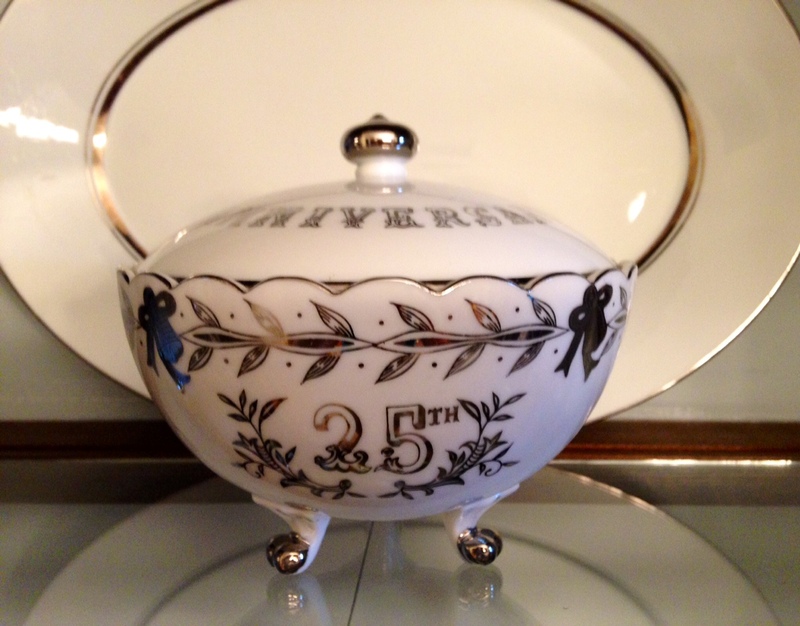 Mother and Daddy reached their 25th anniversary commemorated with many gifts of silver, including this candy dish bequeathed to Cliff and me on our 25th. Then Mother and Daddy celebrated their 40th with a nice party which my sister Jean planned. They even reached their 45th, but not their golden 50th. It was not meant to be. Daddy passed away a few months before their 46th anniversary. I love words. Share yours here. 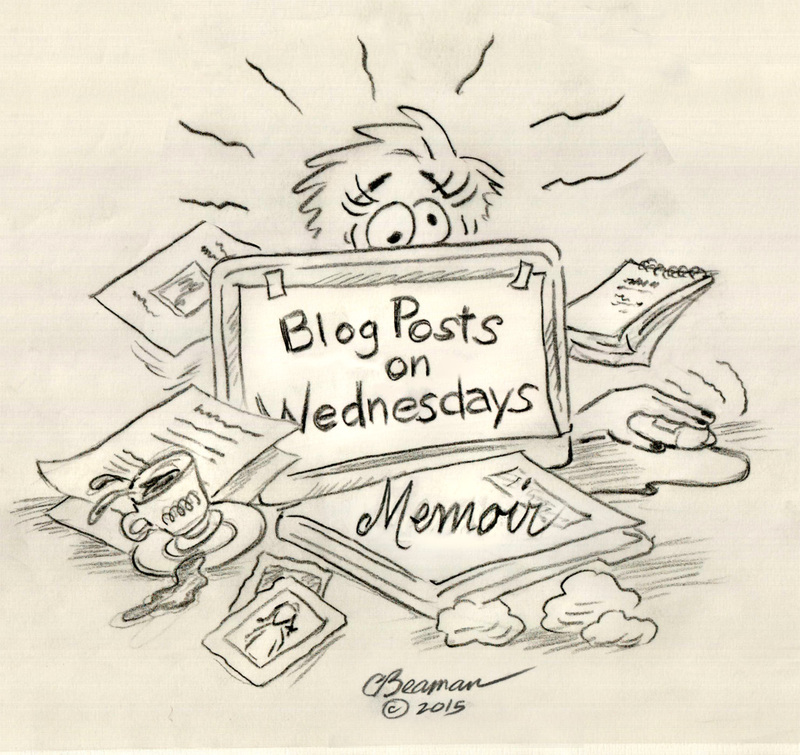 Dear reader: After the August 5 publication, I will be posting once a week on Wednesdays in August, so I can devote more time to memoir writing. I appreciate so very much your companionship on this journey. The silver is lovely, but the many years your parents had together are even lovelier. I’ve always liked that Anne Bradstreet poem. I discussed Bradstreet a bit in my Women’s Roles in Seventeenth-Century America. Good luck with your memoir writing! I enjoy knowing the overlay of history your comments bring to the conversation. Thanks for cheering me on too. As you well know, blog posting is a sprint – writing memoir, a marathon. I salute your decision to focus on memoir while still offering something tantalizing here once a week, Marian. I find it touching that your mother kept the card “from Ray” in the silver chest all those years. We’re both like sponges, soaking it up and wringing/ringing it out in words. Enjoy the conference – safe travels home! I enjoy reading about your parents. I remember being at your house one time and hearing your Dad play his guitar and singing. Of course being “distantly related” I feel a bit of a connection to all of you. We ARE related – and connected here. When I see your name here in this column, I know you can visualize most of the places and the faces. Thanks, Shirley! The silverware is lovely. I am sure the family member who receives it will appreciate it. Good luck on the memoir, you have tons of material. We made a surprise party for mom and dad´s 25th. The gift was a set of stainless steel cutlery. For their 50th Dad took mom to the east coast of Canada to explore the maritime provinces she always wanted to visit. Dad passed away 5 months before their 60th. They were so lucky to have been together for a good long time. Mom still misses him after 8 years of being alone. Thank you for sharing the story of your parents’ silver and golden years. Now it’s all gold for you to mine as stories. The silverware shown here will go to a grand-daughter. Cliff and I have talked about a trip to Canada for our 50th. Prince Edward Island? Maybe you have a better suggestion. Prince Edward Island is on our radar for our 50th perhaps. We have visited Vancouver, BC including Buchart Gardens and Victoria. Also enjoyed immensely Jasper and Banff in the western provinces. Someone said that PEI has huge mosquitoes in the summer. Is that true, I wonder. Thanks for the good wishes, Carol – much appreciated. Good luck with the memoir writing! Thank you for your silvery “chime in.” When we pass on an inherited item we are really not parting with it – just paying it forward. Thanks you too for the good wishes, Susan! Marian … I’m betting your Dad wasn’t a gushing man, but his comment to your Mother was the sweetest: “I couldn’t have found a better wife anywhere!” I loved the poem, too. You are absolutely right – My father was of German/Swiss ilk and not emotionally expressive. We knew he meant it when he made this declaration about our mother. Thanks for your supportive good wishes, Judy! Good stock, for sure . . .
Oh. So glad you can relate! Thanks for stopping by. The silverware still looks new, after all these years. Hope your memoir writing goes well. Looking forward to reading it someday. Your comment is hopeful, and I appreciate the sentiment behind it, Dolores, ever cheering me on. a beautiful wedding with all of my church family and bio family and friends 280 guest. It was wonderful. will miss you twice a week. Hope you get to finish your memior. cant wait the the final product. Your family knows how to celebrate with a Capital “C”! And congratulations on your recent wedding vows renewal. Always good to see you here, Gloria. With Ann Bradstreet’s poem, if she is being honest here, and it certainly seems like she is, I have to marvel at the depth of true love and affection it expresses–in an era when not everyone married for love, right? Very endearing. I’m not surprised to see you deciding to focus on your memoir. It will be fun to see you when you lift your head from those files! If only I had a cartoonist to provide perfect illustrations like your Cliff! Awesome–you should have gotten him to illustrate your rant with the bobbie the other day. Still chuckling. I’m glad I can provide levity with learning while you provide insight. I’ll pass the compliment on to Cliff – he loves, loves, loves cartooning! What a wonderful momento to have passed down to you , your lovely mum’s prized silverware . I am sure the lucky member of your family , that it is given to , will treasure it with all their heart . I really love to hear tales of your family . Sadly I only became one of your fans after you lost your mum …still through your blog I’m getting to know her amazing spirit . You are writing a memoire 😃 you need lots of time for that so allow yourself as much as possible . I do hope I can have a copy when you have finished . I have wrote a memoire of sorts . I have collected all the stories I know and have given them a voice , some has to be fiction because I will never know the true facts. So I suppose it half memoire , half fiction . It’s all written in long hand ready to be put on computer but I am finishing off a Blackcountry fairy tale at the moment ….so it’s taking time …as all writing does . Enjoy yours Marian . You say “I have collected all the stories I know and have given them a voice” – that’s half the battle. As I understand it, memoir is your memory of what happened + what could have happened, especially when it comes to dialogue, which is usually a re-construction unless one has kept a journal. Thank you for your reassurances about time to write my own memoir: I hear the clock ticking in my head, yet I know the best ideas need time to marinate. Also sometimes I impose unrealistic goals on myself. Thanks, Cherry for our comments, always fresh and comforting! Marian — I enjoyed reading this heartwarming post, especially that your mom kept the blue cursive “From Ray” card. And I applaud your decision to post once-weekly so you can focus on your memoir. Yaaaaay YOU! Chatting with friends here is so so much fun here, but I have to change my priorities at least for a little while- so happy we are pals on this journey. I feel the support on all sides – top and bottom too! Sigh — how romantic and lovely! How wonderful! To look back over parents love life. Your post reminded me of my own parents love story! You have stories upon stories many of which you are preserving here and there (your own blog)! Well, my break is supposed to create memoir-writing space for me. We’ll see how that goes. I’m glad you have a keepsake from Grandmother, Debby. One of our most touching wedding presents was a framed, beautifully hand written (and bordered with delicate watercolor flowers) copy of Bradstreet’s “To My Dear and Loving Husband” created by an elderly woman who lived next door to my grandmother. This same lovely lady had made the same gift for my parents when they were married 38 years earlier! When our daughter was married, the dear old woman was no longer alive, so my mother gave hers to my daughter, her granddaughter; when my granddaughter marries (not for many years; she’s only in middle school), I will give mine to her. The tradition continues. Everyone needs a lovely, literary lady living next door. Your comment warms the cockles of my heart once again, Marylin. I love your posts, but know that if they are once a week, I’m more likely to keep up. It’s wonderful when a man shares his love publicly, especially a man who is careful about showing his feelings. He teaches the other stoic guys how to be soft. My grandfather was good at this, as was my father, and my husband. I was a hippie girl and silver was not my thing. I gave away a silver tray and tea set we received from a relative when I married. I hope someone is using it with great joy–and they don’t mind polishing. You always keep up with my posts but I know intuitively that your writing life and its appurtenances are a big drain on your time and energy, so I am doubly honored at your encouragement of this fledgling writer. As a Mennonite girl in the same era (I’m 74), I was at a remove from the culture of the era. No flower child was I permitted to be. When I was out of the house though, I listened to Joan Baez and Peter, Paul and Mary – still do, when they appear on PBS. Thank you, Fatima. I’m glad they resonated with you. I love the way you write and share your history! We are blessed from your memories! My daughter is getting married next summer and she has been collecting silver and milk glass and old mix matched china. But she has to have specifics… bone china etc… and she is now renting out her collection to pay for it… my little genius… But we can only imagine the amazing stories that come with each piece. You already know! You have engendered one resourceful lass there, Diane. She has so much to look forward to, and so do you. I can see it now in my crystal ball and probably one day on some of your blog posts. 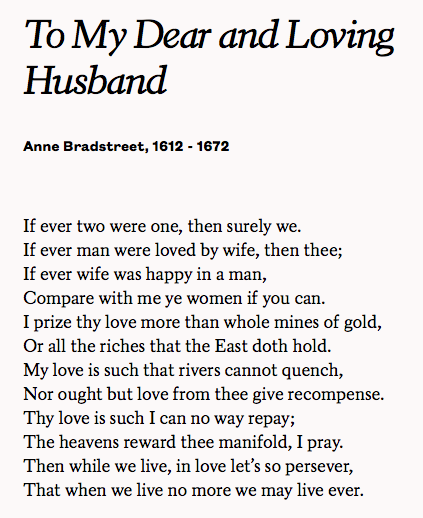 Thanks for including the Anne Bradstreet poem; it made me realize how long it’s been since I’ve read her work. She’s definitely a poet worth knowing! Gee, thanks, Rebecca. My English-teacher past leaks out every so often. This is a case in point!